Across industries, technology plays an increasingly important role in meeting consumer demands. Auto finance is no exception and the continued proliferation of digital lending is a hot topic. Conversations focused on eContracting and electronic assets have increased in frequency, making it clear that transitioning from paper is not a matter of if, but when for the industry. How is Digital Contracting Developing in Auto Finance? While digital contracting certainly enhances the customer experience, it has so much more to offer. By digitizing existing loan origination systems, dealer management systems and portfolio management systems, we’ve found that dealers can more quickly identify funders. Sometimes, they can even finalize the sales process before the buyer has driven off the lot, a revolutionary concept in the industry. For companies that have yet to move to a digital instance, the positive impact of an digital contracting solution is validated and there is an abundance of information and partners available to ease the transition. Auto finance companies and financial institutions are awakening to this realization. More and more are funding the sale and securitization of automotive retail installment contracts to consumers and businesses. Those businesses that have already implemented robust end-to-end solutions have guaranteed their competitive edge. They will be the companies that attract new digitally-savvy talent as well as buyers looking for the most efficient transactions on the market. With financial documentation central to the automotive buying process, accuracy and timeliness are crucial. 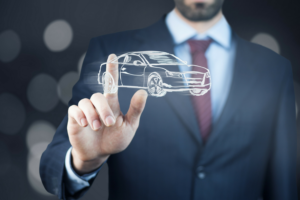 A digital buying process enables auto finance leaders to concentrate on what’s most important: selling, lending and closing—from signature through sale on the secondary market. In addition, moving away from paper removes many of the stress points in transactions that involve people, documents, and data to create faster, easier more convenient and secure processes. If you would like to learn more about the benefits of digital contracting for your organization, we would love to chat. Please schedule a meeting with one of our experts. This entry was posted in Auto Financing and tagged digital contracting, vehicle finance.